BuroHappold Engineering’s Max Doelling is featured in the latest edition of IBPSA's (International Building Performance Simulation Association) quarterly newsletter. The article reports on the release of the latest version of Max’s data visualization tool, Mr Comfy. This high performance building simulation analysis produces many data sets, including hourly thermal and daylight information for an entire design year. This analysis helps gain a clear understanding of projected design behavior. 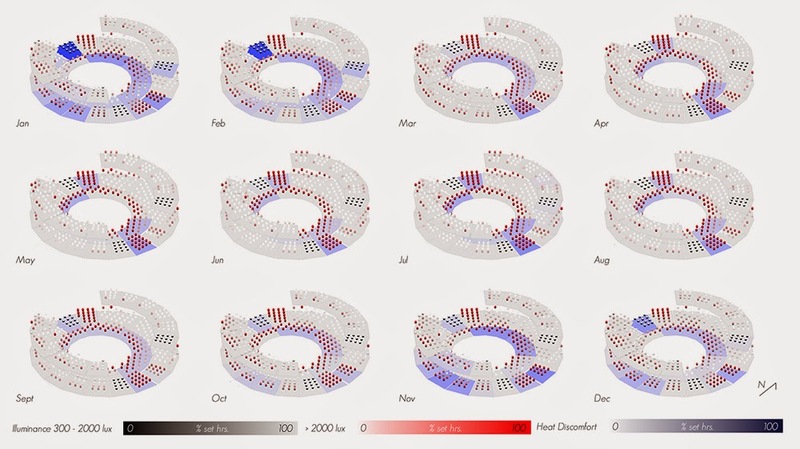 By spatially and interactively mapping results in the Rhino 5 modeling environment, the Mr Comfy tool links building geometry to multidomain performance and helps explore the relationship of multiple performance metrics through condensed spatial representations, such as thermal comfort and daylight use. Already in use across several projects at BuroHappold, it has demonstrated that, especially in a design centric early stage project development context, clear spatial and geometric data analysis helps not only to understand but also to clearly communicate results to clients. This forms a perfect fit with BuroHappold's intent to strive for intelligent simplicity and clarity in engineering.